Most people, when asked, can remember their favorite meal: the aroma that wafts and the way the spices tantalize their taste buds, the feeling of excitement of taking another bite and the disappointment when the meal is over. Every chef hopes that they can create a meal that will be remembered for a lifetime, but before they can hope to obtain this goal, they must learn the foundations of cooking — a skill usually obtained at a culinary school. Salt Lake Community College has its very own culinary arts program that requires five semesters to complete. In addition to two years of related instruction, students will complete 1,000 hours of on-the-job training. “SLCC Culinary Institute is a great option for students because the cost of tuition and other fees are very affordable,” says Jeffrey Coker, associate dean of culinary arts. Students who enter the SLCC Culinary Institute receive a comprehensive education, including an Associate of Applied Science (CTE) degree. They also have the support of a passionate, experienced team of educators that work hard to set students up for success in the culinary industry. Coker has been an educator in the food and beverage industry for close to 20 years. As far as preparing students for employment after college, Coker explains that most students are able work in the industry while in school. “They are able to quickly utilize the skills they are learning in the class and put them into practice in the workplace,” he says. 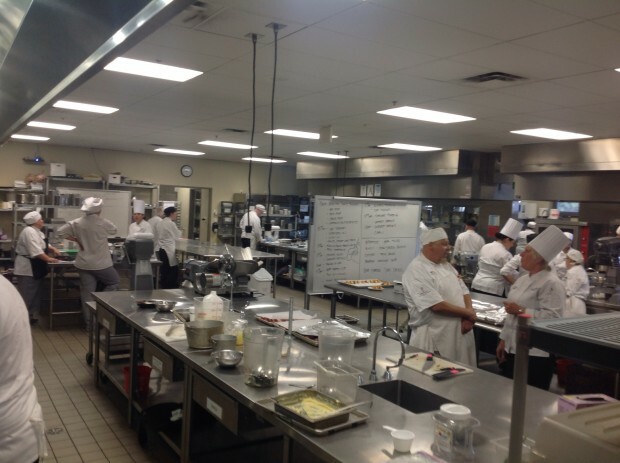 Coker also boasts about SLCC delivering a “well-rounded experience” where students study traditional techniques and current culinary trends, with the opportunity to learn from guest speakers and visiting chefs. Coker is proud to say the SLCC Culinary Institute is currently the only such program in the state that is accredited by the American Culinary Federation (ACF). He wants students to know that if they join the ACF as a member, successfully graduate from the program, and submit their transcripts, they will earn an industry certificate as a Certified Culinarian with no additional written or practical testing. This saves time and adds to both the student’s credibility and builds their resume. While SLCC culinary instructors teach students the necessary skills to succeed, they also have to be honest about the challenges and pitfalls of the industry. What America may not see on television is the gritty side of the industry. Chefs work long grueling hours and sacrificing holidays to the kitchen. Their blood, sweat and tears go into their art. Because of the stress and demands, many chefs have been lost to drugs, alcohol and depression. Assistant professor Franco Aloia is not blind to the hardships and struggles within the industry. However, “passion” is his favorite word to use when describing the industry and his students. He knows that his students are in his class because they have a passion for what they do and what they want to become; they have a love for the art and crave to show off their creativity. Aloia does not shy away from sharing with his students the reality of what they might face out in the industry. He seeks to create a “sanctuary” for students to learn their art. “Everyone is accepted,” he says. Aloia encourages his students to say something and to stand up for themselves, and will assist them in informing the right people to solve the problem. The SLCC Culinary Institute is located at Miller Campus. Call 801-957-5348 or 801-957-5334 to learn more about the program.